The meeting and draw for the 2018/19 Table Tennis Champions League Men will take place this Friday, July 6th, at the Victor's Residenz-Hotel in Saarbrücken (13h30 to 19h00 CET). As usual, top 16 European clubs are going to participate in this prestigious competition, divided in four groups. A total 34 players ranked among the Top 100 at the ITTF World Ranking list are promising spectacular season, with some new names, like UMMC`s FANG Bo from China (actual No. 32), the runner-up from the 2015 ITTF World Championships in Suzhou. Many clubs have made significant changes in their line-ups. Defending champion Borussia signed the 2018 ITTF African-Cup winner Omar ASSAR (WR 17) instead of Stefan FEGERL, while 2017/18 TTCLM runner-up Orenburg has parted ways with former Assian champion Jun MIZUTANI and signed 2015 ITTF European Championships silver medalist Marcos FREITAS (WR 16). 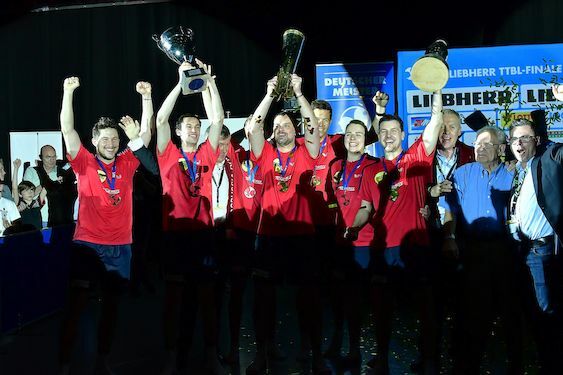 Four-time TTCLM champion Fakel Gazprom now has three former Borussia`s players: Dimitrij OVTCHAROV (WR 3), Marcos FREITAS and Vladimir SAMSONOV (WR 26). No. 3 seed and 2012 runner-up UMMC strengthened its line-up with one more world class player, Jonathan GROTH (WR 19) from Denmark. No. 4 Saarbrucken kept just one member from its last year`s starting trio, Patrick FRANZISKA (WR 25), while LIAO Cheng-Ting (WR 46) and Darko JORGIC (WR 67) are new names. Sporting Clube de Portugal, actual No. 9 seed and last season`s semi-finalists, is continuing with the same line-up from their debuting campaign: Aruna QUADRI (WR 22), Joao MONTEIRO (WR 71), Diogo CARVALHO (WR 194). German Post SV Mühlhausen 1951 e.V, the 2018/19 No. 10 seed, will be unique TTCLM newcomer. They will be represented by former Niederosterreich`s Daniel HABESOHN (WR 53), Ovidiu IONESCU (WR 64), Lubomir JANCARIK (WR 113) and Steffen MENGEL (358).